Solution Saddles Customer Stories: "What the SMART GP saddle has given me is priceless..."
"What the SMART GP saddle has given me is priceless..."
"I started working with Solution Saddles last year, so I am used to hearing good reports from clients who have tried SMART™ saddles. However, I hadn't tried a SMART™ saddle myself until a few months ago; mainly because my horse Annie, at 22, is mostly retired. She can be tricky to ride unless she is in full work, she always has been and has the ability to make you feel like you can't ride most of the time, hence she has been pretty much out of work for the last few years with the occasional wander out - at walk. I am an equine podiatrist so I know and understand the many factors that contribute to a horse’s performance. Over the years I've had all the usual things checked for Annie; feet, back, teeth, saddle, bit etc. but all were apparently fine. So, I concluded it must just be her temperament ... without stereotyping her as a chestnut mare. I've had her since she was four, so I’ve had enough time to figure her out, or so I thought. 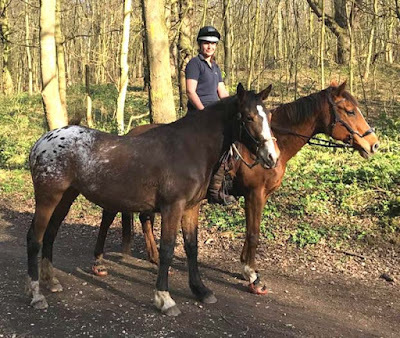 After taking a SMART™ saddle for a trimming client to try, I tried it for myself on Annie, for a quick walk round the block, just to see how it felt compared to a normal treed saddle. It obviously felt different to her. From the first ride until now she has been a completely different horse to ride. She is easier now than she was when we were competing. 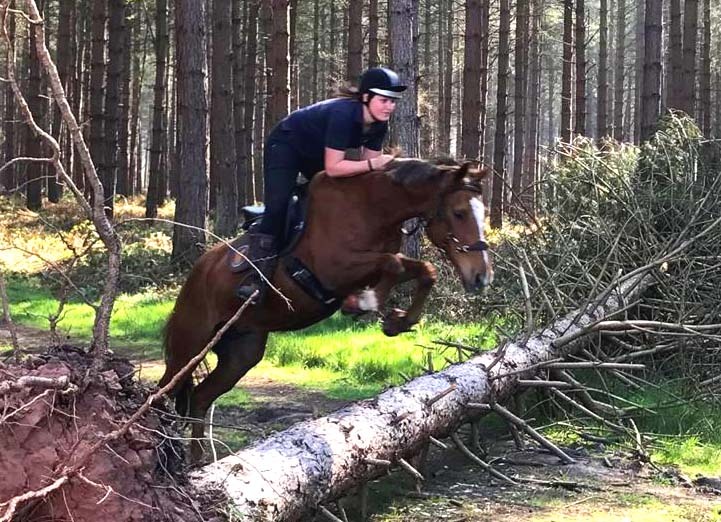 With the SMART™ GP saddle, we can trot on a loose rein, canter on a loose rein, we are jumping again (albeit fallen logs in the forest, but jumping!) and we can walk afterwards without her getting stressed and tense. Those who know Annie will realise what a true feat this is! She doesn't toss her head up in transitions. She doesn't get the strange diamond shaped sweat patch on her shoulder. She's not stiff or sore after a ride. She doesn't rush. She doesn't grab at the bit or run through the bridle. And she hasn't done her silly 2 beat bouncy canter that consistently got me marked down in dressage. She is relaxed. Honestly, it's the biggest horsey investment I've ever made ... I think it costs more than the horse did 17 years ago! But what it's given me is priceless. It's made me fall back in love with riding. The SMART™ GP saddle has given Annie and I the chance to make some more memories even though I'd retired her. It has given my youngster the opportunity to have the best start when the time comes to back her. I owe it to Annie to make her life as comfortable and enjoyable as possible. We owe every horse that. If only I knew 17 years ago what I know now ... our life together could have been very different.